Frog Grog is a Thunderkick slot title. It is the newest game to be released to the online gaming market. It is already proving to be quite popular because of its theme, visuals, rewards and overall game play. The game takes place in a sorcerer’s lair that is presented in great visuals and animations. 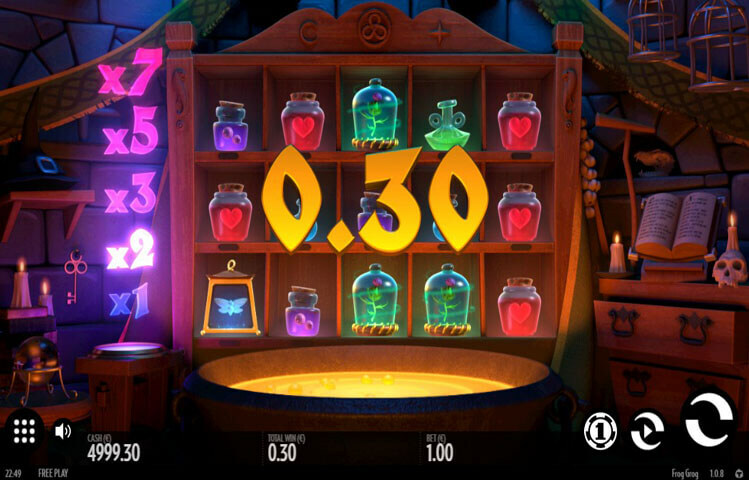 The game has plenty of features including the Dropping Symbols features that can give players plenty of winning chances through the same spin. Frog Grog, the new Thunderkick powered slot is a 23 payline, 5 reel slot game. The game has a wide wagering range that starts at 0.10 and ends at 100 credits. This way, whether you are a low roller or a risk taking high roller, the game’s betting range will appeal to you. The game is also playable across a wide array of platforms. This includes Desktops, Macs, tablets, iOS and Android phones. The game play is pretty easy and simple. This is thanks to the control panel’s buttons that players will toggle through. This includes the spin button, the bet button, the auto play function and more. The new Thunderkick slot is certainly one of its greatest creations. When we think of the slot machine genre, a theme based around frogs is not the first thing that would come to mind. This is because there are many other popular themes like pirates, pharaohs and fruits. Thunderkick has chosen the slimy amphibian creature to be at the center of the game, and it works. The game invites players to join Frog Grog who is found at the lair of a sorcerer. The reels of the game come in the form of a sorcerer’s cabinet with shelves. Across the cabinet, players will see the belongings and the magical potions of the sorcerer that are used in the magical cauldron. These items include glowing moths and prickly thistles among other things. So players better be ready to enjoy a magical experience as they spin the reels, match magical potions and items in order to get paid. The slot machine comes with the Dropping Symbols feature. This means that whenever a winning combination is formed, the matching symbols will vanish. New ones will fall from above to fill their spot, giving players new symbols on the lines. This is why players can expect multiple winning chances with the same spin. Every time this happens, a multiplier will be triggered. It starts at 1x at the first win, and ends at 7x at the 5th consecutive win. The game also has a wild icon which is the Wild Frog. This frog will substitute for all other icons to help players grab a payout. There is also a bonus round that can become active at random during the game play, it is the Mystery of the Frog feature.